Norman Osborn and his Dark Avengers have been ramping up their efforts to hunt down and eradicate Nick Fury's ragtag gang of Secret Warriors. This month, the excrement finally strikes the rotary cooling apparatus. Osborn's pet operatives with HAMMER have caught up with the Warriors at last, locating their base of operations before the stealthy sneaks can leave it behind, and Norman is ready to strike. With Ares and Bullseye in tow, the Iron Patriot is strapped in, geared up and ready for war, and with Nick Fury out of the house on a top secret mission, the bad guys' timing could not have been much better. Assuming, of course, that this wasn't all a part of the Warriors' plan? The very first thing you're going to notice in this issue is the artwork of Alessandro Vitti, which I instantly fell in love with. His unconventional style and focus on individuality gives this team the identity they've sorely lacked since their first appearance in Mighty Avengers #13. I've always seen these guys as a vanilla cluster of also-rans – bland, flavorless and utterly forgettable – but it only took a few panels for Vitti to inject them with a compelling, much needed dose of energy. The stories he tells with each character's expressions, clothing and body language would take an eternity to spell out with words, which frees up his writer to concentrate on other aspects of the story. Vitti also delivers one hell of a fight scene. He gets his chance to flex that particular muscle fairly frequently this month, with amazing results. It's been a long time since I've been this happy to see a set of two-page spreads crammed so closely together. 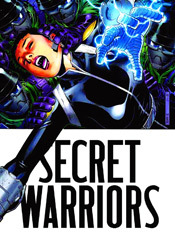 Alessandro skimps on no detail when the Dark Avengers and Secret Warriors come to blows, and writer Jonathan Hickman wisely wastes little time getting us there. The artist's work in this kind of situation is bursting with vigor and overflowing with expressive details, while remaining easy to navigate and expertly composed. I must've spent ten minutes devouring the layout he's spread between pages nine and ten. It's genuinely fantastic work. I was prepared to hate this issue from the moment I laid eyes on it, but it quickly and cleanly worked to completely overcome that initial bias. It's a real surprise, an action book that doesn't shy away from its identity with a dash of spy work thrown in to spice things up. Hickman and Vitti have done magnificent work in taking one of Brian Michael Bendis's less interesting ideas and elevating it into something that's approachable, invigorating and explosive. This isn't what I thought it was, and chances are it's better than you're giving it credit for, as well. Buy it for the artwork alone, the solid storytelling is just icing on the cake.